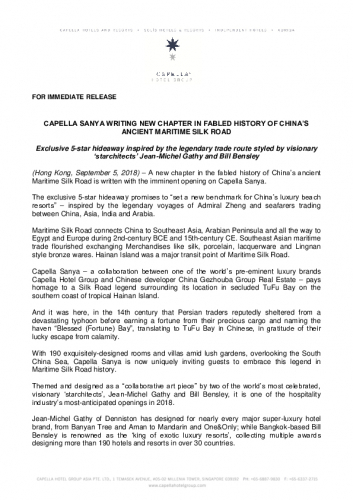 (Hong Kong, September 5, 2018) – A new chapter in the fabled history of China’s ancient Maritime Silk Road is written with the imminent opening on Capella Sanya. The exclusive 5-star hideaway promises to “set a new benchmark for China’s luxury beach resorts” – inspired by the legendary voyages of Admiral Zheng and seafarers trading between China, Asia, India and Arabia. Maritime Silk Road connects China to Southeast Asia, Arabian Peninsula and all the way to Egypt and Europe during 2nd-century BCE and 15th-century CE. Southeast Asian maritime trade flourished exchanging Merchandises like silk, porcelain, lacquerware and Lingnan style bronze wares. Hainan Island was a major transit point of Maritime Silk Road. And it was here, in the 14th century that Persian traders reputedly sheltered from a devastating typhoon before earning a fortune from their precious cargo and naming the haven “Blessed (Fortune) Bay”, translating to TuFu Bay in Chinese, in gratitude of their lucky escape from calamity. Jean-Michel Gathy of Denniston has designed for nearly every major super-luxury hotel brand, from Banyan Tree and Aman to Mandarin and One&Only; while Bangkok-based Bill Bensley is renowned as the ‘king of exotic luxury resorts’, collecting multiple awards designing more than 190 hotels and resorts in over 30 countries. Offering panoramic views of the South China Sea, Capella Sanya is a collaborative art piece by two of the world's most celebrated designers: Jean-Michel Gathy and Bill Bensley. Inspired by a Chinese trader’s adventure alone The Silk Road, Capella Sanya encapsulates the rich culture and heritage of ethnic communities along the historic trade route. “With their combined creative genius, Capella Sanya guests will enjoy a variety of meticulously crafted experiences on a themed journey across the New Silk Road,” said general manager Yngvar Stray. Details will not be unveiled until the opening, scheduled towards the end of this year. But along with Capella’s renowned for spectacular, luxurious hospitality, landscape design and recreational facilities, Capella Sanya promises to “encapsulate the culture and heritage of ethnic communities, inspired by Chinese traders’ adventures along the Silk Road”. The legendary trade route is referenced from grand design to table settings; from ceramics, papermaking, block prints and paintings to artefacts, books, antiques, navigational instruments and fabrics; and from a traditional Chinese tea house symbolising the start of the Silk Road, to a destination spa at the other, with a Moroccan hammam, snow cabin and treatments inspired by Eastern traditions. “Capella Sanya will be the new benchmark for China’s luxury beach resorts, with our pursuit of excellence in real estate development complemented by Capella Hotel Group’s expertise in creating exceptional guest experiences,” said He Jingang, chairman of China Gezhouba Real Estate. Complete with a Kid’s Club for teenagers just 20-minutes from Sanya International Airport, Capella Sanya is also remarkable as China’s first 5-star resort reflecting the government’s Belt & Road Initiative for a modern-day Silk Road re-connecting trade between Asia, Europe, the Middle East and Africa. Capella Sanya is open for reservation from Nov 15th, to book your stay, please visit http://www.capellasanya.com, or contact our reservation team at reservations.sanya@capellahotels.com.